Generally, even Washington is unaware as to why the 2nd Amendment was all about the right to retain arms. People protest and say guns should be outlawed, but the reasoning behind this thinking was to PREVENT war. Charles-Louis de Secondat Montesquieu, baron de La Brede et de (1689-1755) was truly perhaps the most influential of the political French philosophers who did more to alter the course of the world than anyone of this time. Montesquieu was born in 1689, the dawn of the Glorious Revolution in England. That had given birth to the idea of a limited power of monarchy that came at the end of 224 years of true struggle that was marked by the birth of the Wat Tyler Tax rebellion and witnessed a persistent increase in the trend of peasant tax uprisings between 1381 and 1685. This period is often glossed-over as religious rebellions, Protestant v Catholic, but at the core was truly the economic oppression by the monarchy. Montesquieu was originally trained as a lawyer at the University of Bordeaux after being largely home-schooled. In 1720, there was the famous Mississippi Bubble in Paris. Montesquieu had met the Duc d’Orleans who was the real culprit behind that event. Montesquieu began to witness first hand and resent the intellectual inferiors who somehow always manage to gain control of the court of government. To this day, politicians win only because they smile nice. There are never any qualification to hold such jobs. This is like allowing a friend who has a great smile to operate on your heart. In January 1728, Montesquieu was elected to the Academie Francaise. Yet his experience with government and the first big French financial bubble in 1720, was shaping the man through his experience. In April 1728, Montesquieu turned his back on Paris and politics deciding to then complete his education at the age of 39, being more of a late-bloomer than the highly volatile child prodigy such as Blaise Pascal (1623-1662). In Vienna, Montesquieu met the political leader and soldier, the Prince Eugene of Savoy (1663-1736), whose political discussions helped spark ideas within Montesquieu expanding his understanding of government. It was this encounter between Montesquieu and the Prince of Savoy. For Eugene was considered even by Napoleon as one of the seven greatest strategists in military history. He fought against the Turks (1683-1688, 1697, 1715-1718) and he fought against the French in the War of the Grand Alliance (1689-1691). He was the teacher of even Frederick the Great of Prussia (b 1712; 1740–1786) who he shaped into a brilliant military strategist. The Prince of Savoy also fought in the War of the Spanish Succession (1701-1714), but he was plagued by a rumor that he was really the illegitimate son of King Louis XIV of France that he perpetually denied. 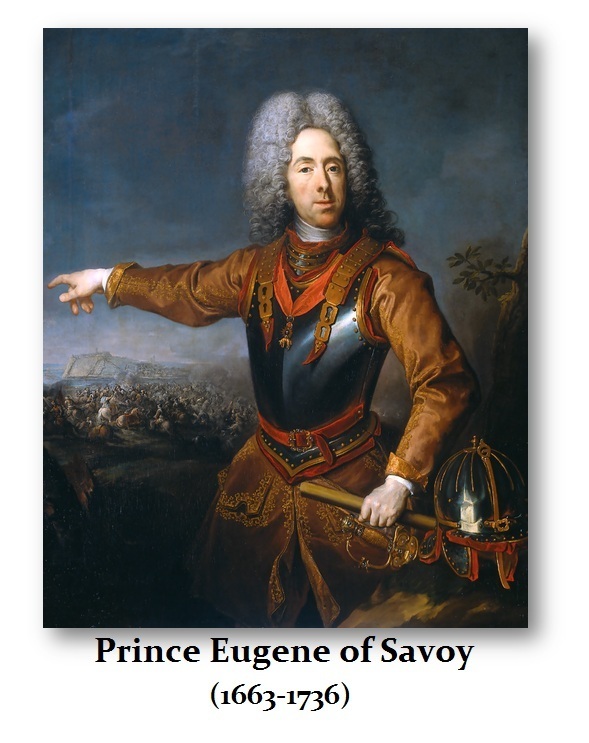 Yet, Louis XIV was always ashamed of such offspring and he restrained Eugene’s ambitions as if he was perhaps his son so that after 20 years of living in Paris and at Versailles, he left France and offered his talent to Leopold I (1640-1705), Holy Roman Emperor who was fighting the Turks. He distinguished himself in the siege of Vienna in 1683 and his military career was born. Prince of Savoy acquired a brilliant skill and the wisdom that allowed him to see that military victory was merely an instrument for achieving political ends. He was Europe’s most formidable general who was wounded 13 times himself, yet always faced a world of cunning foes with conspirators at his back that he regarded as the “hereditary curse” of Austria serving three emperors, Leopold I, Joseph I, land then Charles VI. Of these men, Prince of Savoy considered that the first had been a father, the second a brother, but with the third, he was just the hired help. The brilliant insight of Eugene greatly influenced Montesquieu, that it laid the foundation for the right to bare arms, as the Second Amendment to the United States constitution for the idea was to eliminate standing armies that feed the cycle of war returning a nation as Rome began – citizen militias. The idea was that because you have a large army, kings and ministers eventually use them for it is like having a toy you do not play with, just leave it on the self. So in reality, those that support personal retaining of gun, also support a strong military presence. They have blended the two and created a hybrid that is rather far from the original ideas that were the foundation of the USA. This vortex of war that we are entering is a downward spiral from which there may be no escape. 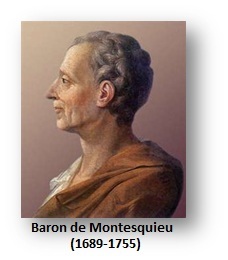 The wisdom of Savoy and Montesquieu is what Jefferson fought for an opposed the Federalists. He was fighting for SMALL government knowing the dangers that would be unleashed by BIG government that included perpetual extortion of the people through rising taxes and subjecting them to international war. History repeats because these passions of man remain unchanged from one century to another. The whole idea of a militia and the right to bare arms as they do in Switzerland was to eliminate standing armies and thereby reduce the risk of war. 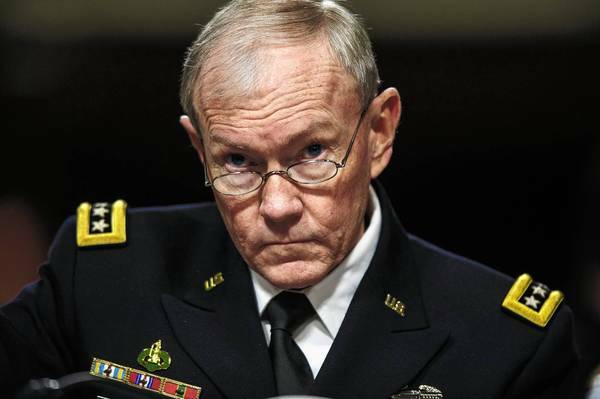 Both Russia and the USA are armed to the teeth. As always, kings and ministers simply view the people as their pawns to move around the chessboard as they like and tax them to death when they stand still. This is exactly opposite of what the American Revolution was all about. Montesquieu is the man who inspired the creation of the tripartite branch of government – executive – legislative – judiciary. Allowing the executive to appoint former prosecutors as judges defeats the entire system. To allow the Supreme Court to pick and choose what it wants to hear eliminates your right to an independent judiciary for it is now simply the prerogative of kings and ministers. For the judiciary to say you cannot challenge the government unless it does something to you is absurd for then the constitution has no force of law and they get to do whatever they like and it is your burden to then prove you even have any constitutional rights. Unless you are “rich” no one can afford the legal fees to defend your pretend rights so they really do not exist. Everything the Constitution was intended to create has been circumvented and career politicians cannot and do not “represent” the interests of the people – only government. Congress passes taxes and regulations the people would never do and have no clue what they are even doing.